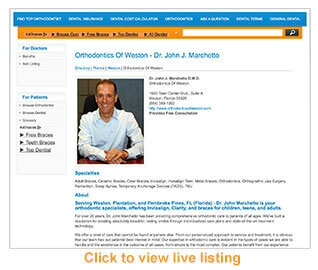 BracesInfo.com is the premier resource connecting patients with the orthodontics providers. Established in 1996, we are the larget and most regarded online hub in the orthodontic industry. Thousands of patients visit BracesInfo.com each month in search of the right provider. Participating doctors may add their practice including a full online profile with link to website. Patients are using the internet to shop for providers. Traditional advertising such as Yellowpages is fading away. Generate leads from a highly targeted audience. One lead from BracesInfo.com exponentially pays for your listing. Another online medium that produces quality leads. BracesInfo.com is the #1 site for Braces and Invisalign information, since 1996. Start Getting QUALITY Leads Immediately Upon Live Activation.